Here is a very delicious and special recipe to all my dear friends. 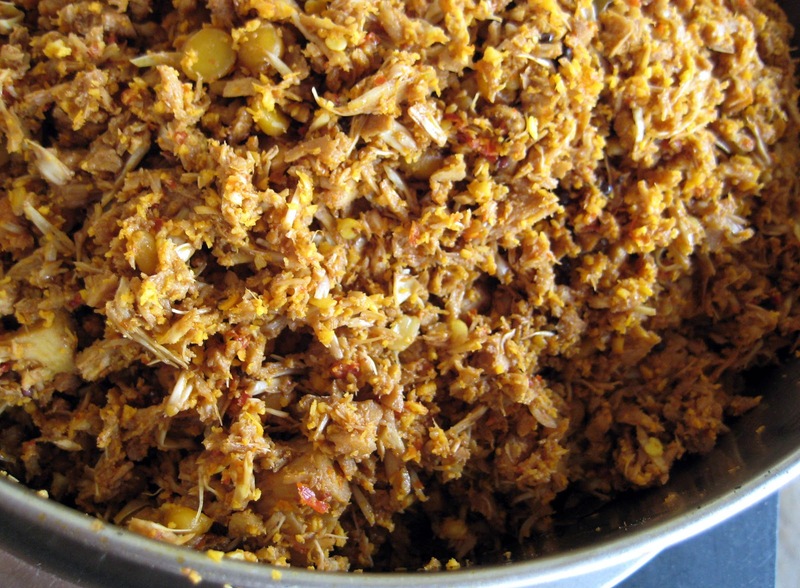 Spiced Tender Jack fruit is one of my favorite dishes which goes super duper with chapati or rice. I have brought 2 tender Jack fruits from India although I get tin here. I just chopped them into pieces and dumped into the freezer:). I learnt this recipe from my amma, she had prepared special palya for us during our last visit. I just clicked few snaps ;). I will come up with few other tender Jack fruit recipes soon :). Until then enjoy Spicy hot palya. Peel off the tender Jack fruit( big task enjoy:)), make halves and remove the middle hard portion if its very hard(gunju in kannada). Then finely chop. My mom shared a very easy method of chopping Jack fruit , I just follow it ;). To be frank, chopping tender jack fruit is a patience testing task, if you have lots of patience have fun chopping else you follow this method: once you feel off and removed the middle hard part cut them into approximately 2-3 cm cubes then transfer into a mixer grinder jar give a jerk for 30-45 secs. Check once then continue jerking if it has to get little more finer..Please do not add water while grinding. Heat 3-4 tsp of Oil in a pan, add all the tempering ingredients. Then pour the chopped or Ground Jack fruit. Add salt to taste and mix well. In the mean while, roast Coriander seeds, Cumin seeds and red Chilies wirh 1 tsp of oil. Then grind with Coconut and 1 tsp tamarind extract using little water. Then pour the ground mixture to the Jack fruit, add 1 cup of water and jaggery. Mix well, cover and cook for 8-10 min. Allow water to evaporate completely, then just roast it on a low flame for 8-10 min again. Make sure it doesnt burn. Serve with Chapati, rice or with any item of your choice. Note: You can use Tinned teneder Jackfruit if you do not get fresh ones but Do not grind as I said above, just chop into small pieces. Looks delicious n yummy stir fry,love it!! this looks really tempting. I am salivating here. Was looking for how to cut the raw jackfruit and which part to be used and your post helped. Cooked according to the above recipe and it was very aromatic and tasty. Thankyou.